Fortress Kijkduin, together with a fortress on the isle of Texel, a fortress on the former isle of Wieringen and the pillboxes at Kornwerderzand (at the "Afsluitdijk") together form one large fortification. 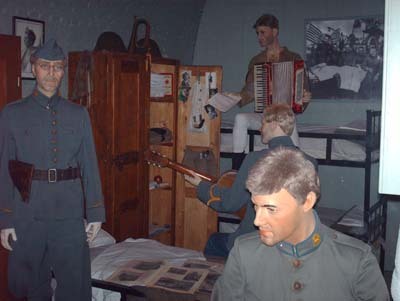 In 1914-1918, the fort was mobilized. 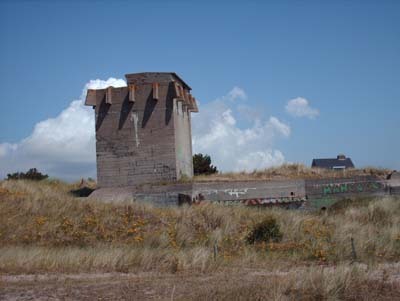 In 1938 the pre-mobilization took place but the fortress of Kijkduin remained unoccupied, except for the artillery fire control on top of the fort. The soldiers were part of the crew of the naval barracks called Fortresss Erfprins of the nearby city of Den Helder. They were positioned in the tower in order to establish the coordinates of a possible enemy. This fire control cupola has a thickness of 15 cm (approx. 6 inches) and weighs in total approximately 46 tons. The Germans cut a hole in it with an oxy-acetylene cutter in order to extend an enormous antenna. The cupola itself was built in France in 1897 by a French firm (Schneider cy). 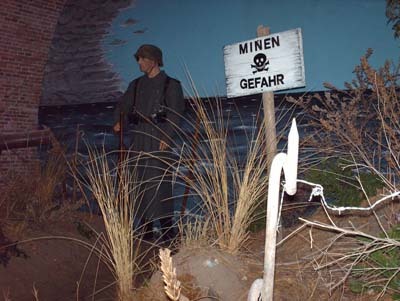 In May 1940 the fortress was taken over by the Germans (without striking a battle). 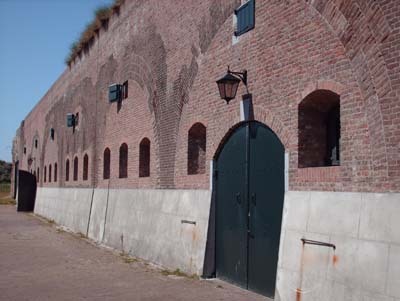 Because there were more than enough reinforcements in the area to serve as military fortification, the fortress of Kijkduin was equipped to serve as a training fortress for the naval artillery. The Germans however improved the fortress with an extra top layer of reinforced concrete which was constructed by a building firm from Den Helder. In order to disarrange radar (e.g. of passing aircraft) large iron stakes were placed on top of this roof. In the eastern wall of the fortress two very large gates were installed and the road from the east side (which runs uphill) was paved, just like the surrounding moat. This was done in order to be able to enter the fortress with trucks where they could be discharged without anybody being able to distinguish which cargo was being unloaded. It is now known that fort Kijkduin was the place where training was performed and tests were carried out with the latest types of torpedoes and anti aircraft materials that could enter the fortress without being noticed by possible spies. So the main purpose of the fortress was training of naval personnel. Next to that the fortress was being used for large partying (in the presence of many a collaborator). The third purpose and that has been only recently discovered by reading special archives about naval intelligence, was the function of an observation post. It appeared that a direct telephone connection cable had been installed from Norway in order to improve and support the Atlantik Wall. Near the fortress a large Wehrmacht (Army) centre was build in 1942. (If you visit the area, before you ascend in the direction of the sea dyke, you turn left and enter through one of the two narrow gates on to a parking area; today the building can still be distinguished as the ‘Casino’ or the German Officers’ mess). The German Officers’ building served as a base for radiographic connection which was made with the so called "Kroontjesbunker". A trench ran from this bunker to the above mentioned radio communication building. In order to establish coordinates of the approaching aircraft radiography was employed in the "Kroontjesbunker" and also in Fortress Kijkduin but also other means like binoculars, all kinds of measuring instruments and later on also radar were employed. The fortress has never been bombed even when there have been at least 117 bombing raids on the nearby city of Den Helder.